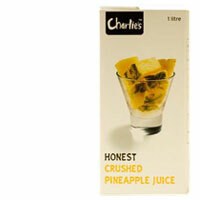 Anyone know where I can get something like Charlie's (link slightly NSFW) Honest Crushed Pineapple Juice in the States? I grew up experiencing pineapple juice from a can (like most others in the US). I remember the simple joy of punching triangle holes in the top of the canister with a can piercer, and then remembering to shake the can. I also remember that awful metallic taste that would linger long after I’d taken my last sip. After several years of buying my last can of pineapple juice, I somehow managed to pick up a box of it (it comes in boxes now) while I was in New Zealand of all places. It tasted fresh, it had bits of pineapple pulp floating in the juice and best of all, it didn’t have that metallic taste (most likely because of the box). So, does anyone know where I can get some just as good as Charlie’s Honest Crushed Pineapple Juice (link SFW, click on the pineapple link)? Stateside of course. Sidenote: I’ve tried the Ceres brand, it’s yummy, doesn’t have that metallic aftertaste, but it’s not quite as good as I remember Charlie’s as being, specifically because it comes sans pulp. Any other suggestions?